I spent a wonderful weekend down in Melbourne enjoying the city’s fabulous food and wine offerings (as my tannin-stained lips attest). Here’s the round-up of my favourite discoveries (excluding my absolute favourite, MoVida – it needs its own post to do it justice so stay tuned). This cozy cafe is tucked away in one of Melbourne’s many laneways, but I was most excited that we turned up at 10.25pm on Friday and they were still happy to cook us dinner – that’s a big deal to a Brisbane girl. The tasty Italian food (mine – veal and white wine agnolotti in napoli sauce, his – the prawn ravioli special) wasn’t mind-blowing but it was wholesome and definitely hit the spot. The breakfast menu looked pretty good too so I’d give that a go next time I was in town. 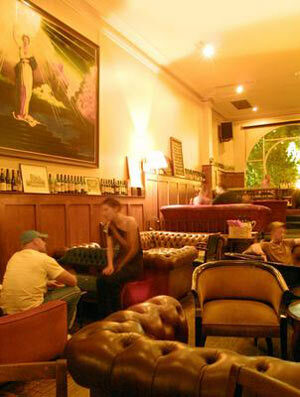 The Melbourne Supper Club is hard to find – a small, dark sign hanging above a door is your only clue – but it’s the perfect spot to either recharge your batteries before continuing your assault on the town or to wind down with a midnight snack and a coffee before taking yourself (and possibly somebody else) home. The comfortable couches, wooden side tables and scattered antiques make it feel like an oversized version of my grandmother’s lounge room but in a good way (see above photo). The food isn’t spectacular but the polenta chips and welsh rarebit we shared were just what our pickled bodies craved. The wine/spirits list was one of the most extensive I’ve seen and the coffee pretty good too. I’d definitely be a frequent visitor if a place like this existed in my hometown. After a big night out, I want nothing more than a good coffee and an amazing brunch. If a little hair of the dog (in the form of a bellini or bloody mary) is on offer as well, so much the better. Miss Jackson in St Kilda delivers on all counts. The cafe has a gorgeous deck decorated with pots of red geraniums and an airy wooden inside, making it modern yet comfortable. The coffee was perfection, as were my corn fritters (which were more like corn pancakes) topped with bacon, avocado and blistered cherry tomatoes. The staff were chatty and judging from the table of tipsy locals next to us, this is somewhere you can easily pick up where you left off the night before.